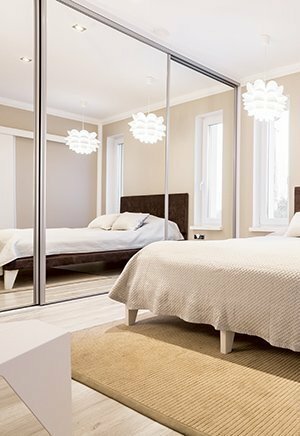 Features and Specification of Sliding Mirror Doors. Made to measure sliding mirror doors, to fit your space perfectly. Top and bottom track set included free. All running gear, top guides and bottom rollers prefitted for convenience. Anti jump mechanism fitted as standard. Optional deluxe pack including soft close, buffer strips and top positioners. Coated in high quality polymer grained polyester paint all finishes provide high mechanical resistance according to ISO 3270. Adjustable from 0-32mm by means of an adjustment bolt and incorporates an anti- jump feature. High strength plastic wheels with vibration damping rubber and sealed ball bearing races are fixed to an elastic moving arm which follows the sliding mirror door track precisely.